Is the male idol’s action over the line? Over the past few days, netizens have been shocked by the message that Leeteuk sent to the fan account of Yeonwoo (MOMOLAND). According to Super Junior’s leader, he sent this message just to compliment MOMOLAND member who worked hard when they led the Asia Song Festival together. However, it seems that the public does not completely trust Leeteuk’s reasons. 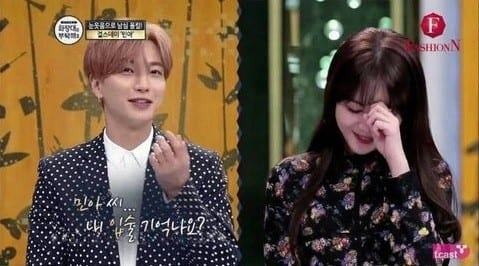 On a KPOP forum, many users had mentioned the incident of Leeteuk kissing Minah (Girls’ Day) on television, thus implicitly implying that the male idol has a lot of unusual behavior towards female colleagues. Han Chaeyeon: What happened when you guys kissed on the lips? Leeteuk: Minah-ssi…do you remember my lips? Leeteuk: We had a hidden relationship, and Hyeri asked us to kiss if we were dating for real. –Ahjussi, what are you doing right now?